And now, in the "Good Heavens, Don't You Have Something Better To Do?" category, I offer my saga of restoring (and by "restoring", I mean "making usable") a 1990 BMW 525i. Since I posted the above to the Web, a number of people have asked me why I haven't continued the log. The answer is simple: There wasn't anything to report. I drove it and drove it and drove it and drove it. I did replace a light bulb or two, cleaned the trunk light switch and replaced some coolant hoses and the heater matrix, but none of these were worthy of mention. Now the heater matrix did involve a lengthy assembly/disassembly process that had me intimately bound to a Phillips screwdriver for the good part of an evening, but it was as straightforward as a job can get. If you're feeling cheated because I didn't share, I can tell you it went something like this: Remove a cover. Unscrew a screw. Remove a part. Repeat, ad infinitum, until the matrix is exposed. Replace the matrix and put it back together. In fact, my 1990 was so trouble-free it was getting a bit, well, dull. I'm not a big fan of automatic transmissions, either, so I started keeping my eye out (on a hideous stalk, unique to my species) for another project. 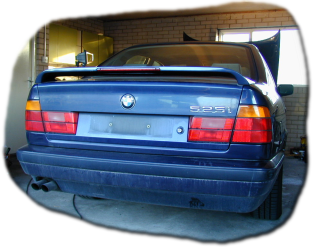 One fine day, as I was on my motorcycle, I passed a classic car lot and spied a '92 525i. On a whim, I asked the owner if he'd do a straight swap for my '90 525i and my '87 520i, which I hadn't driven in over a year. And now, in the "Oops, I've Done It Again!" category, we present an ongoing tale of improving (?) a 1992 525i. A year or two passed, in which I wrote nothing. Sorry. Then, whilst on holiday in Scotland, someone ran into my car and that was the end of it, alas. So, I bought a 1997 BMW 535i.